Nesip Can hid in the mountains of Turkey for four long years. Following a military coup in 1980, the 24-year-old politically active young man fled for safety, disappearing without a trace. He was unable to contact his relatives at the risk of endangering their safety. His family and friends had no idea if Nesip was dead or alive. In 1984, Nesip took refuge in the Netherlands. While he settled in nicely, learning the language, continuing his education, and even finding love, he felt like half a man, not able to communicate with his family. 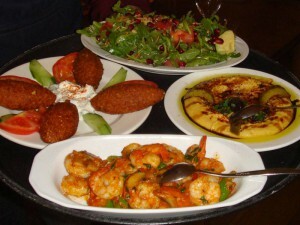 Moreover, he missed a place where he could enjoy Eastern Mediterranean cuisine, especially mezzes – the Turkish equivalent of tapas – and grilled specialties. In 2002, he and a few of his friends teamed up to open Restaurant Orontes, bringing flavorful creations and a bit of his home to the Amsterdam scene.